Don't care much for the source as a Lutheran Republican myself, but it does make a good point. of Trump ever claiming that he's an evangelical fundamentalist...I've only heard him say he's a christian which seems a rather loose term by definition. 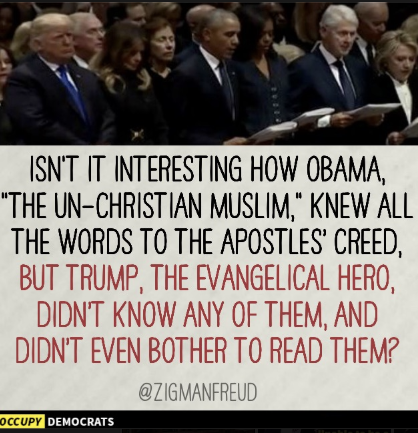 As OccupyDemocrats routinely mocks religion one would think they'd be more upset by a belief in a god they don't believe in by someone who was one of their own, who knew they were suddenly concerned about the christian rituals at a funeral for a man they hated when he was alive? But reading a creed from a book like Obama, Carter and Clinton did means nothing if the heart is not committed to Christ! Has nothing to do with any Protestant. Also Trump is high church Protestant, not Evangelical. Clinton is Baptist (low church Protestant, and just moving his lips like Obama). Aside from the odd funeral and wedding I haven't been inside a church in the 30+ years since. I highly doubt I could even begin to recite that piece of claptrap.